the Bear Blog: Sewing Tips for Ten! 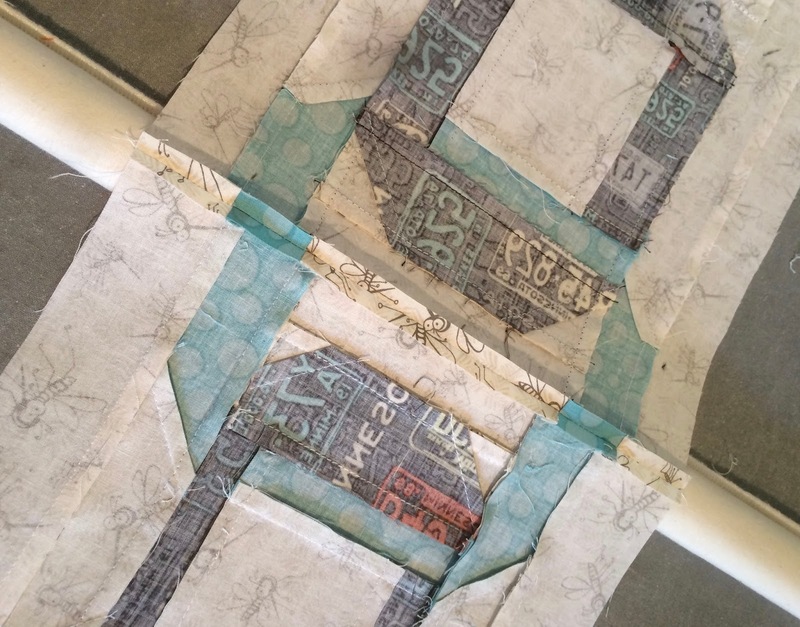 There are some tips and information that I want to share with you regarding my new quilt pattern, Ten. This is kind of an add-on bonus to the printed directions for Ten. The Ten pattern is available for purchase at Bear Patch. The blocks in Ten used quite a few of the "corner squares", AKA "snowball", or "cheater corners". I re-named them because in my opinion, it's not cheating to build a better block and improve on techniques! 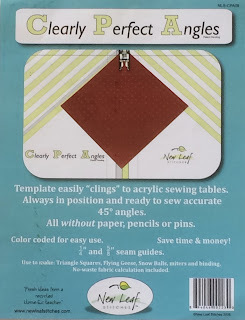 I would use a triangle template and a matching strip that was cut at a 45 degree angle on both ends. Simply hand stitch on the seamline, and you've got it! Then came the sewing machine revolution! We discovered that our sewing machines could stitch together quilt block pieces in a fraction of the time of hand sewing! We went through a period of adjustment and acceptance before this machine work was viewed as legitimate. When I started attending my local quilting group, Ham Lake Piecemakers, the majority of the group did entirely handwork. Or maybe they were learning to piece by machine, but always quilted by hand. Thanks to a few friendly and open-minded members, they took me in anyway! Now the tables have turned, and those who do hand piecing and hand quilting are few and far between. I still dabble in the art of hand quilting a bit, but I love my machines! So now, there is a method to make those little triangle pieces on the corners of a larger strip or square or rectangle by machine. By stitching a diagonal line across a square shape and the larger shape beneath it, we can mostly eliminate any problems with stretch on that bias edge. But, we need to practice accuracy or else we get sloppy results. There are 3 methods I am going to cover for this technique. 1. 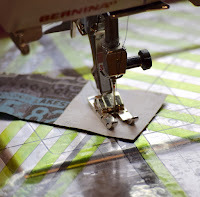 Place a strip of masking tape on the bed and tabletop of your machine, in line with the foot. It only needs to be about 4" long. Mark a straight line down the tape. Put the needle down and center the marked line with the needle. Make sure it isn't slightly angled one way or another. Don't let the tape come in contact with the feed dogs. That would really screw things up! Feed one corner of the little square to the needle. Keep the opposite corner of the square on that center line as you continue to feed it into the needle. No need to backstitch because these will be sewn into another seam later and prevent the ends from loosening. Drawback: this doesn't work with large pieces because you can't get a line of tape extending forward far enough to accommodate something like an 8" or 10" square. Depending on the type of tape used and how long it's left in place, you could get some gummy residue. 2. There are several products that can be purchased to use instead of the masking tape. These all afix to the bed and tabletop of your machine in some way. Probably my favorite is Clearly Perfect Angles. It is a "cling-on" sheet of plastic that has the markings for the diagonal seams, plus more. There are directions for using the additional markings in other piecing. Plus, if you are sewing garments, there's a 5/8" line printed on the plastic to guide your fabric. Here's a link to a short video demonstrating some of the features of this product. Drawback: purchase required, and you have to remember where you put it! Advantage: it is easy to put in place and has the option to be left in place indefinitely (so you don't have to remember where you put it!). 3. Draw a pencil line on the wrong side of the little squares from corner to corner. Use a ruler that's small enough to be convenient and just a little longer than that diagonal line needs to be. It's best to use a sheet of very fine grit sandpaper on the table top. You can even purchase sandpaper boards. The grit holds the fabric still but isn't rough enough to make a bumpy surface. If you have the fabric on a smooth surface and apply much pressure to the pencil, you can get a little "wave" of fabric just ahead of the pencil, and that inevitably turns out crooked. Use a mechanical pencil to keep a sharp point and fine line. Advantage: very little expense required (sandpaper and mechanical pencil). You might have noted that quite a few of the newer patterns call for pressing your seams open instead of to one side. If you have made garments, pressing seams open is the norm. For a long time, we have had it drilled into our quilting brains that we always press seam allowances to the side, usually the darker of the 2 fabrics. I'm not 100% sure of why that was the absolute correct way to do it, but I have a theory! When seams were hand stitched with a running stitch, there could be little gaps visible if the seams were pressed open and then stretched. By pressing to one side, anything visible through a tiny gap in stitches would just show as ordinary fabric. Flash forward to today, with machines that sew a neat and tidy seam, and there are no gaps! So if that was the reasoning behind the pressing question, it now is invalid. And we can press any direction we want! When I have some bulk in the seam at points where seamlines cross, it can look much neater to press open. And I have a handy little helper for that! The Strip Stick! It's a fabric covered stick, flat on one side and slightly curved on the other, and available to purchase at Bear Patch. When I lay the seam on the curved side of the stick, it is easier to get the tip of the iron started on the seam correctly between the 2 layers, and continue the length of the seam. There are several lengths available, I use the 18" size for all of my needs. I can press one section, then slide and reposition for the next area. Give it a try--you might just be surprised at how you like it! but many other sewing and quilting uses. If you are interested in purchasing the Clearly Perfect Angles and/or Strip Stick, please contact the store at 651-429-1039. 19th Anniversary & Remodeling Sale! Bear Patch Becomes Pumpkin Patch For A Day!